In a recent Decision No. 1/2533, the Thailand Board of Patents has considered the subject matter of Patent Application No. 0201003643 entitled “Method for Treatment of Hepatitis C Virus” as a method of treatment and rejected the application despite that the claims were amended to a “Swiss-type” use format. A “Swiss-type claim” or “Swiss-type of use claim” is a claim intended to cover the second or subsequent medical use (or indication) of a known substance or composition. Take the case of aspirin. Initially, it is a chemical compound which is known generally, and also is known to have a medical use (e.g. as a painkiller), and was later found to have a second medical use (such as preventing heart problems). Without the benefit of patent protection, there would be less incentive to undertake research into new uses of known drugs. Here, the chemical structure is already known, and may not be patentable since it lacks novelty. Only the purpose of the treatment is new. And this purpose brings the new use dangerously close to the prohibition against methods for treatment of the human body. Under Section 9(4) of the Thai Patent Act, “methods of diagnosis, treatment or cure of human and animal diseases” are excluded from patent protection. The Swiss-type use claim was thereafter rapidly adopted by the pharmaceutical industry. Swiss-type claims have therefore generally been found acceptable by patent offices such as Singapore and Indonesia over method of treatment style claims. In Thailand, prior to Decision No. 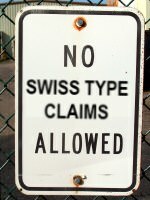 1/2533, while methods of treatment were considered as non-patentable subject matter, Swiss-type use claims were allowed. However, this does not seem to be the case now as the Thai Patent office began issuing Office Actions as early as January 2011 rejecting Swiss-type use claims. This controversial decision, which has raised a lot of questions among practitioners and relevant parties, appear to be contrary to past guidelines issued by the Thai Patent Office. As can be imagined, the impact of such a decision will have great impact on the pharmaceutical industry. Due to the uncertainties arising as a result of these changes, many affected pharmaceutical companies have experienced further delay in the prosecution of their patent applications before the Thai Patent Office, as well as reservations as to ambit of the claims which they can make. While these controversies have been brought to the attention of the Thai Patent Office, we all eagerly await how the issues will be resolved.